Germany hosts the world's largest industrial fair "Hannover Messe". It is attended by about 6 000 companies from 70 countries. Russia is represented by a general exposition with separate stands of the most active regions, including Tatarstan, Moscow and the Perm region. 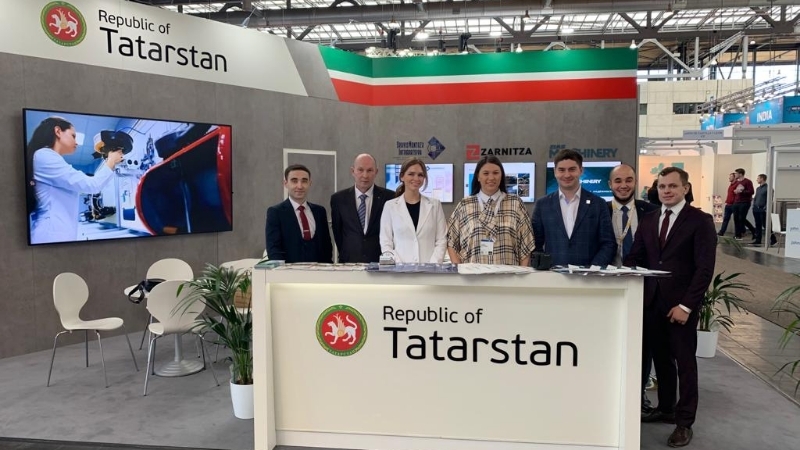 Tatarstan’s delegation was headed by the CEO of Tatarstan Investment Development Agency Taliya Minullina. "Participation in the exhibition is of great importance for Tatarstan as an innovative region of Russia. Having studied the market trends and prospects of the fourth industrial revolution, we represent the potential of our republic on the world stage, expanding international contacts and building effective cooperation to attract investment and expand markets", - Taliya Minullina shared. To reveal the investment potential of the region, an exhibition was organized with the presentation of the leading companies of the Machine-building cluster, Kama Innovative Territorial Production Cluster "INNOKAM", as well as the Production Association "Zarnitsa", OOO "ServisMontazhIntegratsiya" and the republican products under the brand "Made in Tatarstan". Taliya Minullina held a number of business meetings in order to build effective cooperation with government and business representatives and attract investment in the economy of Tatarstan. The possibility of implementing wind energy projects in Tatarstan was considered by the trade representative of Russia to Germany Andrey Sobolev and representatives of Saxon companies. Taliya Minullina held talks with the leadership of the Indian engineering company on the localization of production on the territory of our republic. The exchange of experience in the implementation of investment activities, as well as further cooperation was discussed with the Minister of Economic Development and Investment of the Perm region Maxim Kolesnikov. The Head of Tatarstan Investment Development Agency acquainted the Director of the Business Development and Investment Promotion Department "Invest in Qatar" Abdulbasit Talib al-Ajji with the business program and opportunities for business expansion in the frames of the International Economic Summit "Russia - Islamic World: KAZANSUMMIT". The expansion of areas of cooperation was discussed with the Honorary Consul of Russia to Lower Saxony Heino Wiese. Negotiations on the development of partnership were held with the representatives of the German concern Siemens, which has an experience of successful cooperation with such Tatarstani companies as "TAIF-NK", "KAMAZ", "Kazanorgsintez", "Nizhnekamskneftekhim", etc. Negotiations on cooperation, including the prospect of implementing joint projects are underway with representatives of Chinese industrial enterprises looking for partners in Russia. Hannover Messe 2019 exhibition will last until April 5. The main topic of recent years is integrated production and energy. Representatives of both global corporations and startups present their solutions for industrial production and sustainable innovative energy supply systems. The business program of Hannover Messe contains conferences and summits, where leading thinkers and leaders of innovation in government, industry, business and science share their experiences and form a forecast for 2025. Considerable attention in the work of exhibition is paid to the opportunities offered by the use of artificial intelligence in industrial production. 5G technologies are also presented. Suppliers and users of network equipment demonstrate the functionality that can provide a new standard of mobile telephony on the test bench. Hannover Messe brings together promising and leading players in the global market, reveals new requirements of the digital industry, introduces key technologies and promotes the emergence of new projects. Solemn opening of the regular flight "Kazan-Astrakhan" in the framework of the program of subsidizing regional air transportation from the federal and regional budgets took place in Kazan International Airport. The delegation of the Republic of Tatarstan under the leadership of the President of the Republic Rustam Minnikhanov arrived in Copenhagen (the Kingdom of Denmark) to expand the spheres of cooperation with other European states. Burak Başeğmezler: "Tatarstan is an interesting and promising market for us"
Electrical Electronics Services Exporters' Association (TET - Turkish Electro Technology) visited Tatarstan Investment Development Agency.